Thank you for the overwhelming show of support and help in the past months. I very much appreciate it and am very grateful and forever in your debt. After a much needed rest and recuperation, my partner Ben and I, together with my family, and friends have been busy looking into many different options of re-opening Tiffins. To this end I am very grateful to many Tiffins friends, who have also been busy helping us. But alas my preferred option to reopen Tiffins as A Social Enterprise, is currently not possible as it needs a lot more time, effort and expertise, which at present I don’t have. 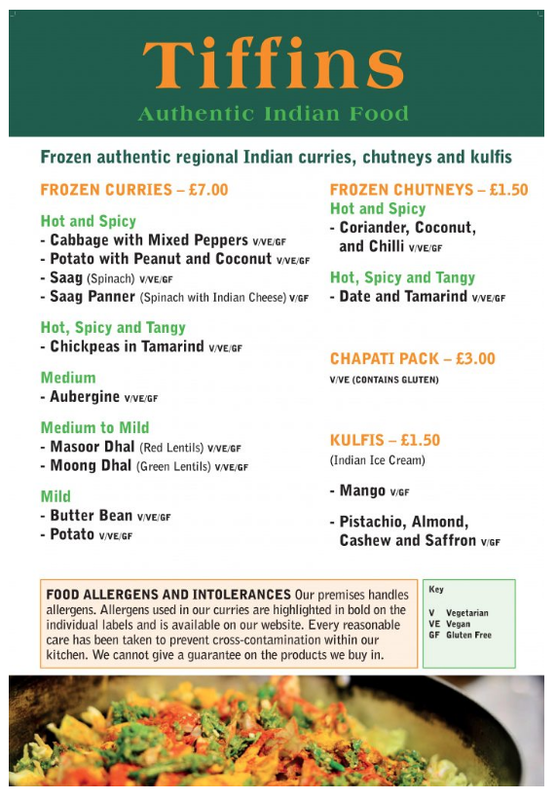 So, in the meantime we have decided to offer Tiffins curries – frozen from our site on St Michael’s Hill, together with chutneys and kulfi (Indian ice cream). We are trying this out for three months, as this as a new concept. There is also going to be a Pop – Up from another local independent Vegan business – Miller Green at Tiffins for three months. Both, will open from Tuesday 12th February – From midday to 7 pm – Monday to Friday. Please keep checking our website and Facebook page for further updates.